What would you look for if you were hiring a stranger to do a job that you had to rely on them and trust them to do? 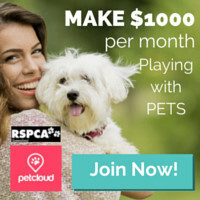 In order to create a professional looking Pet Sitter Listing, you need to put yourself in the shoes of a busy Pet Owner who is searching for Pet Care online. Typically, they are short on time, and big on wanting to find the most trustworthy, reliable person to look after their pet. Your listing represents you and what you want to say about yourself and the experience you have to offer. To start with, your profile photo is represented as a thumbnail throughout various areas of the site. 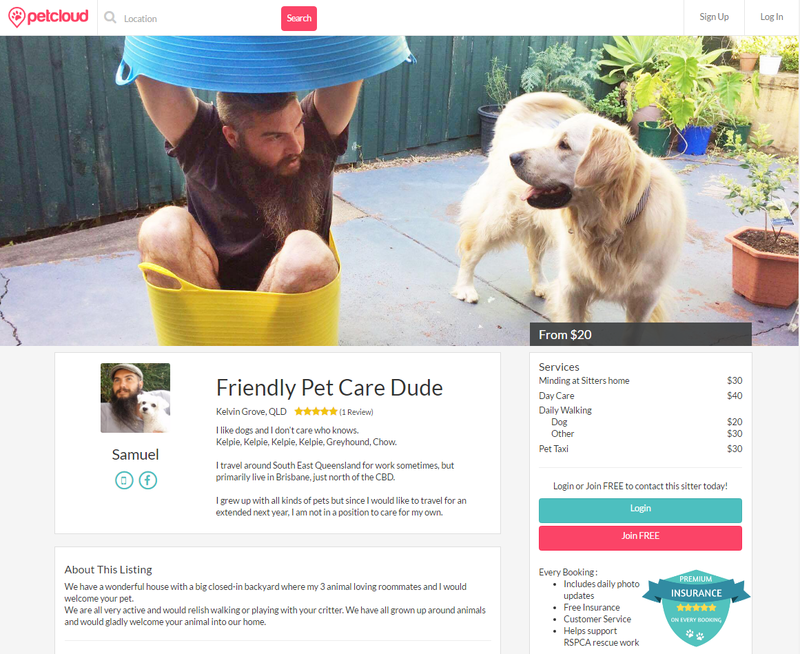 It needs to show your face, but should reflect you as a Happy and Professional looking Pet Lover. It's the first thing the Pet Owner will notice as they are scolling through Pet Sitter listings in their area so make sure its your best. See below for example. 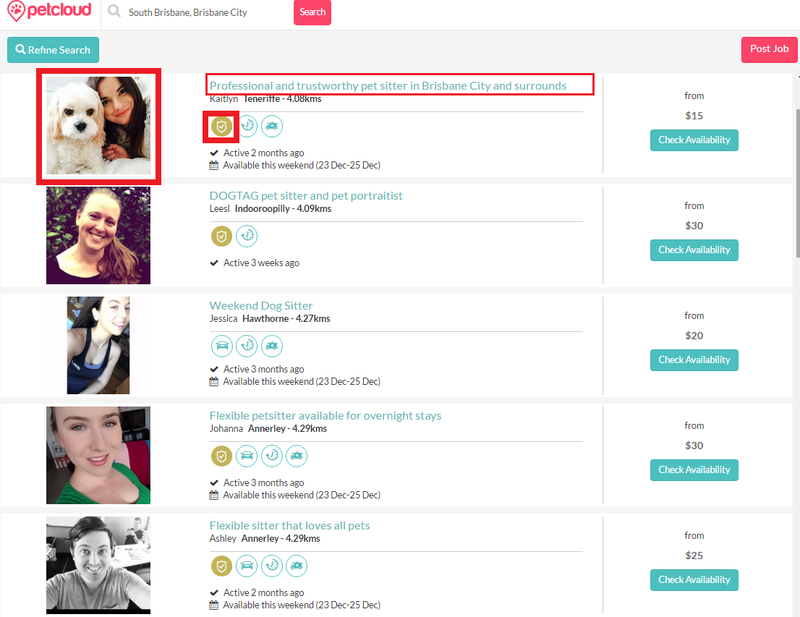 Immediately you can see the first listing stands out amongst the other listings as the Sitter has a clear, smiley, profile photo with a little dog. The title of her listing mentions what she does and where she services. The gold badge shows she has also arranged to be police background checked through PetCloud's partner, and has no criminal history recorded. Tamika (below) is another example of having a listing that is a complete standout from other Sitters in her area with a clear smiley profile photo, 5 reviews, and shows shes earnt lots of badges, and has gotten a police background check. Keep scrolling down to see awecome examples of listings!! 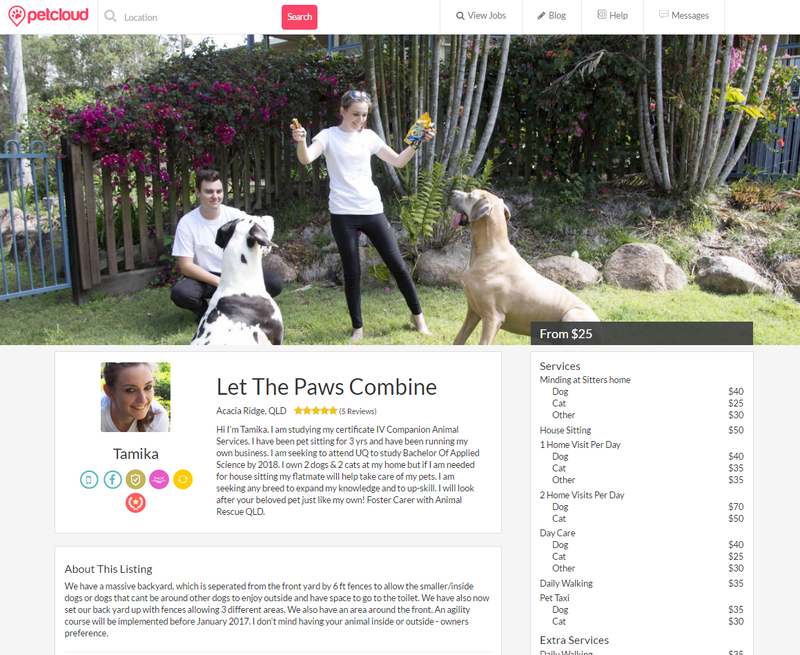 Creating a professional looking pet sitter listing on PetCloud is easy. 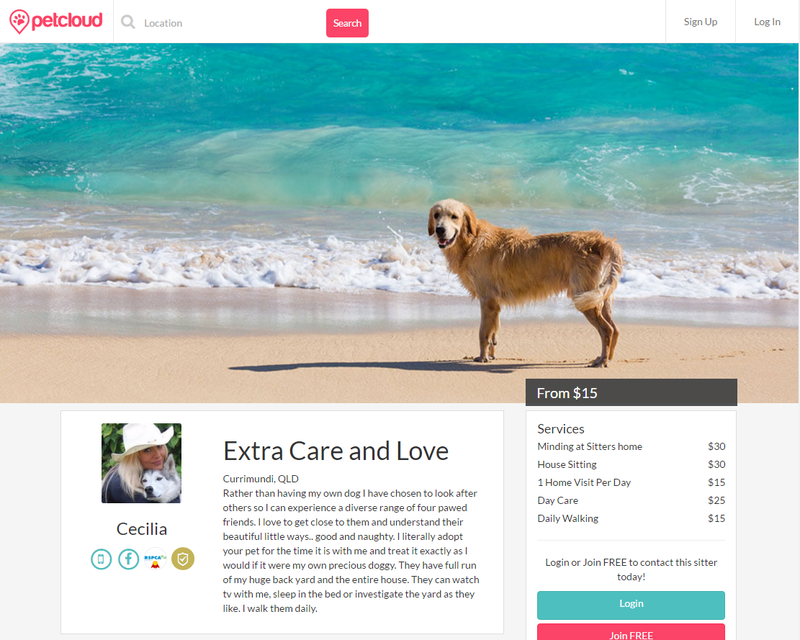 It relies on 2 things: 1) High quality photos taken with a digital SLR camera of the sort of pictures that Pet Owners are looking for, and 2) a professional sounding listing that tells Pet Owners about your experience with pets, tells them about why you are the best choice, and gives them references they can read from former clients. Sam's listing is unique and that's why we love it. Sam has uploaded goofy pictures of himself, enjoying time with pets. He tells Pet Owners that he loves Pets, but the reason why he does pet sitting, is because he does'nt have any pets of his own because he has to travel around and be away so much. He isn't trying too hard to come across as something he's not. He lets Pet Owners know he has a full time job doing completely unrelated work but in his spare time when he's home - hanging out and goofing around with your dog is what he enjoys. James and Sarah offer house sitting in Melbourne and have some great professional looking photos. Her professional looking photos reflects someone who is confident and experienced with handling even large dogs (not everyone is, so don't put this if you aren't). She has taken the time to write about her animal related studies, and her motivation to be running her very own business. She tells Pet Owners that she is flexible in the locations that she services and is experienced in both house sitting and pet sitting. She helps cement confident with Pet Owners by also confirming she has a secure large backyard with plenty of room for dogs to do what dogs love. We love Jenny's listing with her high fiving chihuaua as the sun is setting on the beach and her rainbow profile picture - it's a total standout. It shows she just loves animals and nature. Totally unique. Upon going up and spending some time with Cecilia, she is one of the most well-travelled, humble, stunningly beautiful people you could know (inside and out). Cecilia has a former career as a model and tv presenter in Australia and then moved overseas. She has now moved home again to Australia but has moved to the coast for a sea change but sadly had to leave her own dog where she used to live in Europe so she prefers to pet sit other peoples pets for now. I even witnessed Cecilia pick up a steaming huge pile of $%#%$# from someone else's large dog had left at the beach and thoughtly found a bin and put it in because she believes our beaches should be kept beautiful but also she doesnt want the Council banning dogs from the beaches where she lives. That's the kind of person she is. Now to her listing - she has a police background check, and has done the RSPCA Qld accredited Pet Sitting course. She also displays high quality photos that shows where she likes to walk with dogs. 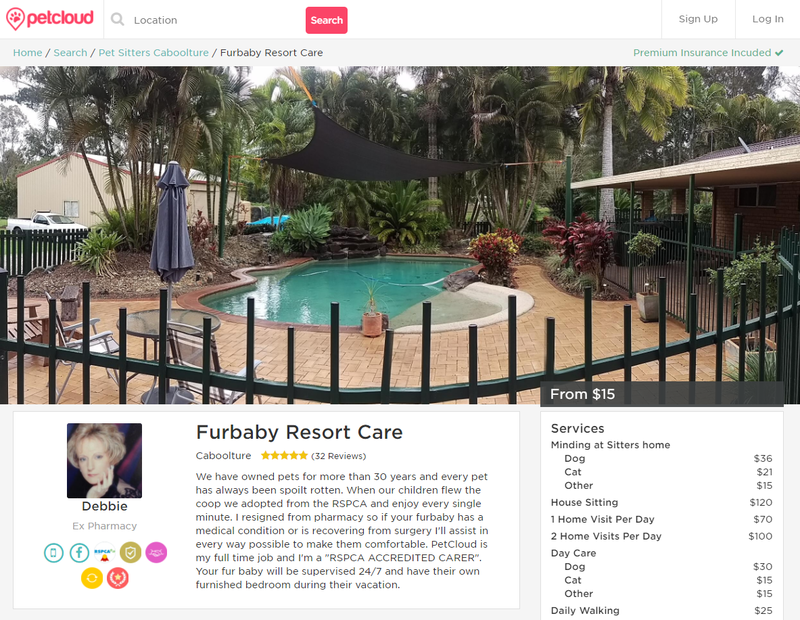 Debbie used to work in Pharmacy and has now side-stepped into Pet Care where she has proved extremely popular with Pet Owners in the Caboolture area who just love her and her husband Warren. She is able to put her medical knowledge to use particularly when monitoring senior pets and likes to keep Pet Owners informed with regular photo updates, particularly if a dogs behaviour, or toileting seems irregular. Debbie's listing has lots of great photos that show where pets can play safely and also shows secure high fencing. 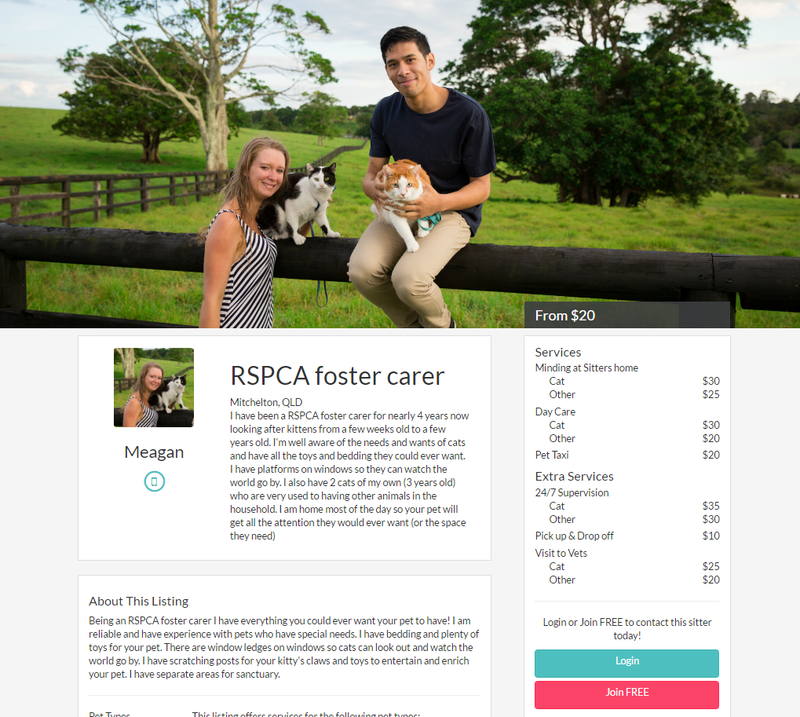 Debbie has also taken the time to undergo online RSPCA Qld accredited pet sitter training, a police background check, and is very responsive to pet owner inquiries. 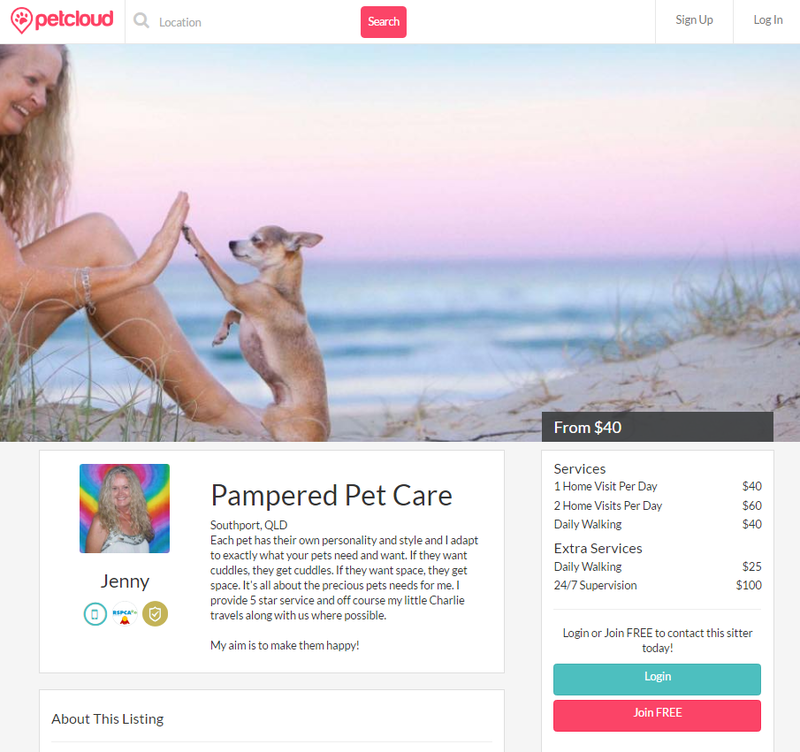 She has also put up PetCloud flyers on her local community notice boards and has PetCloud Sitter business cards that she asked our team to personalise for her. Debbie also has a stack of 5 star Pet Owner reviews which she asks Pet Owners to leave for her on her listing. To top it all off, she is a great communicator, and makes an effort to welcome pets and their owners with a warm smile and by remembering and using their names. Well done Debbie! Creating a trust-worthy listing just got easier with our exclusive new deal on professional photography. 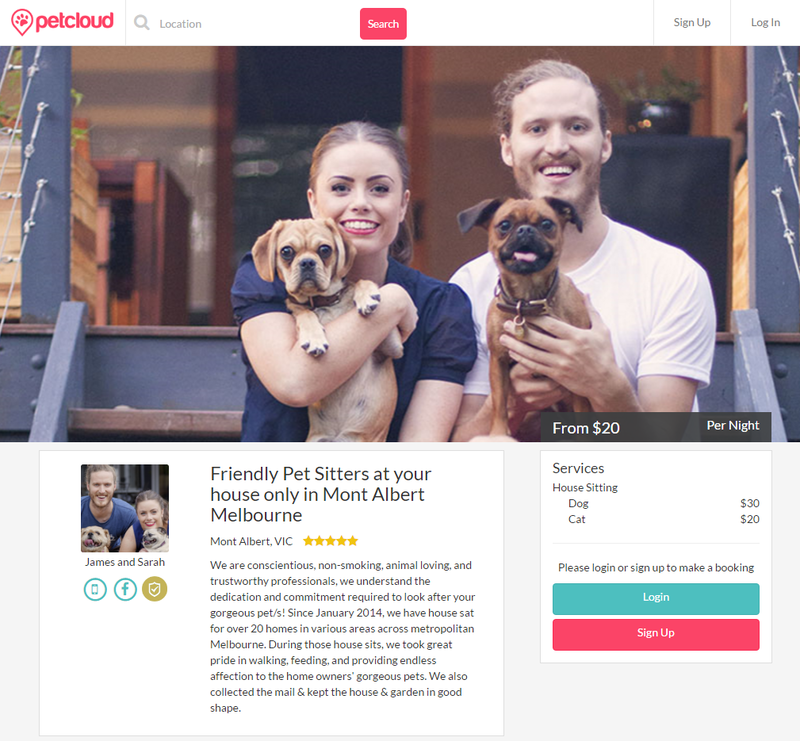 We've now teamed up with professional photographers across the country to offer you an exclusive PetCloud professional photography package for just $199. Want in on this great deal? This offer is available in most cities around Australia, so simply let us know by email, we'll sort out the details and then it's just a case of Lights. Camera. Upload!